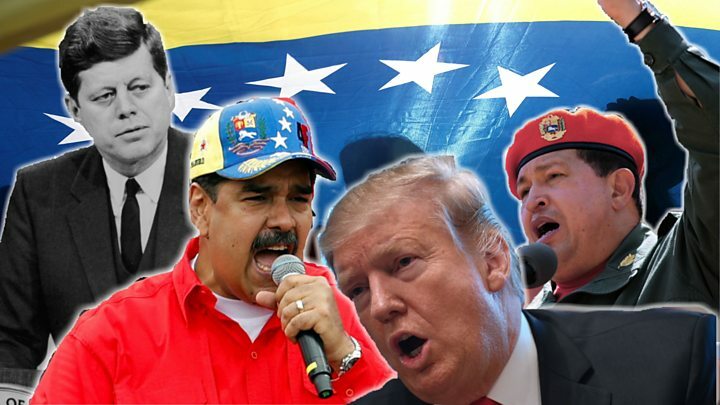 US President Donald Trump has appealed directly to the Venezuelan military to abandon their support for President Nicolás Maduro. In a speech in Miami, the president warned "the eyes of the entire world" were on those propping him up. Mr Trump said those who continued to back Mr Maduro's government were risking their own futures and lives. President Maduro condemned Mr Trump's speech as "almost Nazi-style" and said the military would respond with unity. Venezuela's president is refusing to step down or call new elections, despite mounting international pressure. It comes after dozens of countries, including the US, have recognised opposition leader Juan Guaidó as the country's interim president. The head of the country's opposition-led National Assembly declared himself interim leader during anti-government protests last month. Mr Guaidó has vowed to oversee fresh elections on the grounds that Mr Maduro's 2018 re-election was flawed. Mr Maduro has criticised outside influence in the country's internal affairs and has maintained the support of his military and several key allies. The government says it will stage a concert on the Colombian border at the weekend to rival a similar event - on the other side of the frontier - organised by UK businessman Richard Branson in support of the opposition's aid effort. Mr Trump gave a speech on Monday at Miami's Florida International University to a crowd of mostly Venezuelan and Cuban immigrants. The area is home to tens of thousands of Venezuelan expatriates - many of whom fled Mr Maduro and his predecessor, and support for Mr Guaidó there is strong. During the speech, Mr Trump railed against the Venezuelan government which he described as a "failed dictatorship". He described President Maduro himself as a "Cuban puppet" and accused a "small handful at the top of Maduro's regime" of stealing and hiding money. "We know who they are and we know where they keep the billions of dollars they have stolen," he said. 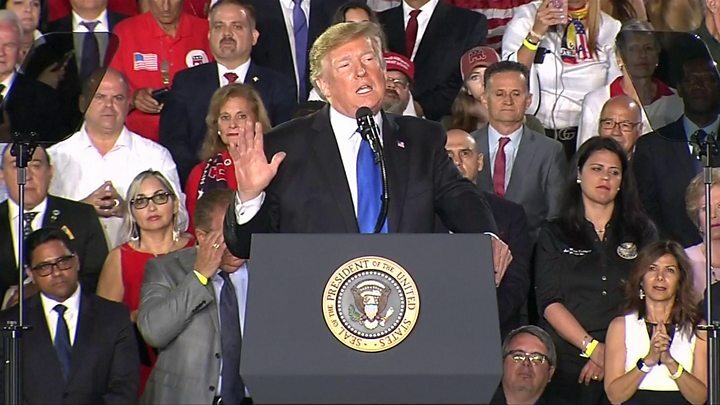 "They are risking their future, they are risking their lives and Venezuela's future for a man controlled by the Cuban military and protected by a private army of Cuban soldiers," Mr Trump said. The president also said he believed the military had a "vital role" in the country's transition if they switched sides. He urged them to take-up the opposition leader's "generous offer" of an amnesty or face consequences. "You will find no safe harbour, no easy exit and no way out. You'll lose everything," he warned. Mr Trump reiterated his full backing of Mr Guaidó as the country's rightful leader during the address. He said that he still sought a peaceful transition between the leaders, but reiterated that "all options are open". The president also described a "twilight hour" for socialism on the continent - expressing his hope that Nicaragua and Cuba could follow behind. What is the latest in Venezuela? US economic sanctions are putting pressure on Mr Maduro, while tension continues over international aid collections organised by Mr Guaidó. On Saturday US military transport planes arrived in a Colombian town bordering Venezuela carrying hundreds of tons of humanitarian goods. A bridge between the two countries is currently being blocked by shipping containers - and is not clear if President Maduro will allow it to enter. He has previously denied there is any crisis in Venezuela and has called the aid operation a US-orchestrated show. "He would rather see his people starve than give them aid," Mr Trump said during the speech, urging the military to ensure its safe delivery. Another collection has started in Brazil, and A third is expected on the Dutch island of Curacao off Venezuela's north coast. Mr Guaidó has said 600,000 volunteers have already signed up to help carry the aid into the country on 23 February - the deadline he has set. Republican Florida Senator Marco Rubio was among those who visited the border where the aid was being stockpiled on Sunday. Image caption Mr Maduro has labelled the US aid carriers "war planes"
He was re-elected for a second term last year, but the elections were controversial, with many opposition candidates barred from running or jailed. There were also allegations of vote-rigging. He has retained the support of key allies who have helped bankroll the country's economy, including Russia and China.